Hear Weezy's limp response to the Kanye West-signed rapper's YMCMB-targeting "Exodus: 23:1"
“Thou shalt not raise a false report: put not thine hand with the wicked to be an unrighteous witness.” That’s the Bible verse that serves as the title of former Clipse half Pusha T’s snarling, Notorious B.I.G.-sampling track released last week, “Exodus 23:1.” Though most media reports so far have cited modern, Americanized translations, there’s a certain poetry in the classic King James version. That word, “wicked,” says a lot: The Virginia Beach hip-hop veteran didn’t just quote the ninth of the Ten Commandments, which warns against bearing “false witness”; he carefully aimed his shots at someone who was teaming up with, in his Manichean worldview, the bad guys. It’s masterful hip-hop marketing, and so far it looks like Pusha is winning. 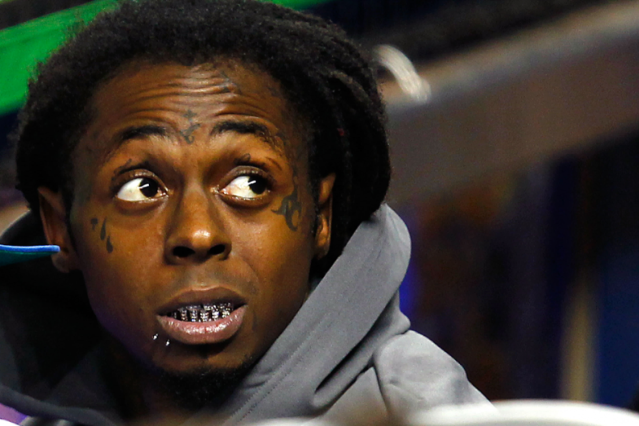 The presumed target of “Exodus 23:1″ was Young Money rapper-singer Drake, which label boss Lil Wayne effectively confirmed with a terse tweet last week: “Fuk pusha t and anybody that love em.” That, as it turns out, is the first verse of Weezy’s 90-second response, titled “Goulish” (via RapFix). Where Push’s track was all focused aggression, Wayne’s rambling verse here reprises his long-stale talk of his supposed alien status and Bloods gang affiliations — Lil Tunechi would’ve been better off just pointing to his peak-era Da Drought 3 track “Ride for My Niggas,” which preempts Pusha’s allegation (sung by collaborator The-Dream) that “them niggas ain’t dying for you” and throws in a beatifully stoned Gremlins movie reference for good measure. Meanwhile, Pusha — who is signed to Kanye West’s G.O.O.D. Music imprint — has already released a video for “Exodus 23:1,” as SoulCulture points out, and the gritty visuals should only ratchet up the hostility. Comparisons between West’s G.O.O.D. roster and the Weezy-affiliated YMCMB crew were inevitable, so there’s a certain business genius behind escalating the confrontation to full-on “beef” status. Wayne’s stable dropped the We Are Young Money compilation three years ago, and that’s a model West looked to be planning to continue with his upcoming G.O.O.D. compilation — now known to be titled Cruel Summer, the same title as the art film that West premiered last week at the Cannes Film Festival in France. By attacking his closest rival head-on, West can destroy comparisons altogether, much as Cannes cohort Jay-Z ultimately did in his epic early-2000s dispute with Nas. What’s startling about all of this is that it has forced mainstream news outlets like Time and CNN to cover rap music. Here Killer Mike has released a contender for Album of the Year with his El P-produced R.A.P. Music, but the way to generate massive media coverage turns out to be not to put out the best that hip-hop has to offer, but to let the news pundits point to a couple of rappers fighting, which squares right in with preexisting stereotypes of the genre. As AllHipHop.com points out, media interest in rapper beef isn’t necessarily innocent. But then again: This is all sort of exciting, isn’t it? The biggest rapper in the game, Kanye, taking aim at the one man who used to stand between him and the throne, Wayne — through the voice of one of the most commercially underrated rappers of the past couple of decades, Pusha? As critic Tom Breihan pointed out in his chapter on Nas and Jay-Z for the book Rock and Roll Cage Match, rap “has direct competition in its DNA.” The Beach Boys and the Beatles might have squared off by trying to outdo Revolver or Pet Sounds, but ever since the days of LL Cool J and Kool Moe Dee, on through the tragedy of Notorious B.I.G. and Tupac Shakur, rappers haven’t been content just to outrap each other; they want to trash each other, too. Right now, West and Pusha have Wayne on the ropes. And considering former Cash Money rapper-producer Mannie Fresh has reportedly been working with West, the knockout punch could be coming up soon.